That's right, it's about time I finally got a chance to stop by this quickly growing establishment by the name of 33 Acres Brewery near the Broadway-City Hall station. As a family owned brewery, 33 Acres oozes of distinct style and a bustling, friendly vibe. Along with brewing their own beer, 33 Acres partners with various food trucks and other indie eateries in the city to bring a truly new type of dining experience. On the day of our visit, we were lucky enough to be visited by Tacofino "White Lightning" in the front which offers a small selection of delicious tacos and chips&salsa. My friend and I settled for the amazing-sounding fish taco ($5) which comes with comes with chip mayo, salsa, cabbage, and crispy cod. Decently portioned with wonderfully battered and crisp pieces of cod. The quality of the fish reminds me a bit of my favourite fish n chips place down at Steveston - Pajo's. 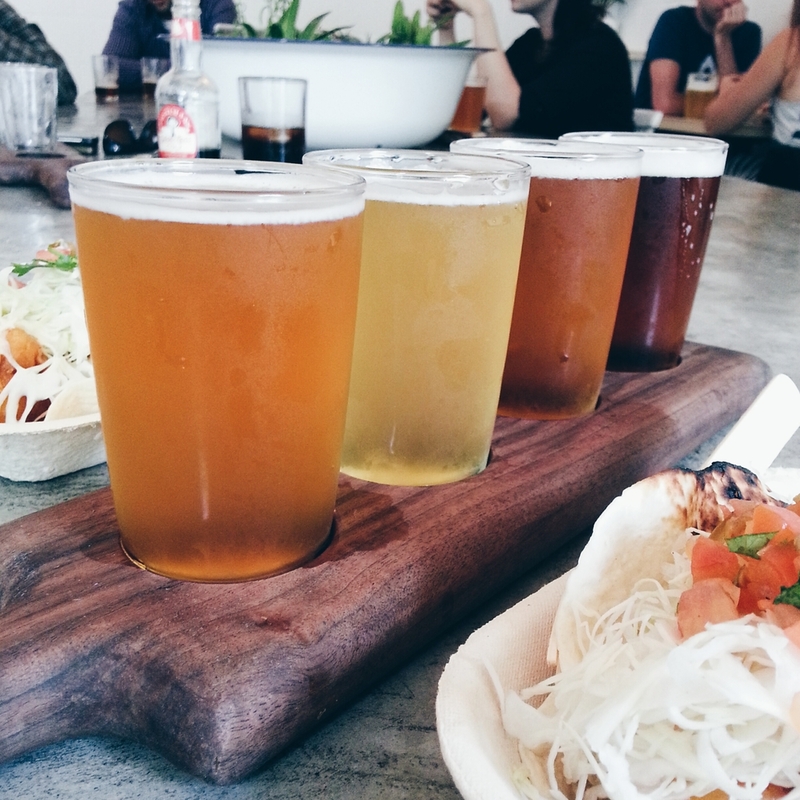 We found a spot at the gorgeous long table inside 33 Acres and of course, couldn't pass up the opportunity to try the beers for the day by ordering a beer flight ($10). The day's flight consisted of their Life, Ocean, Sunshine, and Merckx brew, all very distinct in flavour - which I loved. Look at the below picture if you want to see the actual ingredients in each glass! Sunshine is definitely the lightest and most refreshing out of the choices. The orange flavour stuck out to me the most and definitely adds to the freshness of every sip. I would probably recommend this one for those who are light beer drinkers or simply don't like rich and more bitter beers. Ocean (pale ale) has a more deep and rich beer taste as well as fruitiness thanks to the citrus. Merckx had the most distinct flavour in my opinion- it started out with a wonderfully aromatic citrus flavour, then a bitter beer taste, and finished off with a slight black pepper aftertaste. Memorable and for people who are looking for a more interesting type of beer. Life (lager/ale hybrid) was the most bitter but was very crisp and robust in flavour. Definitely more catered toward beer lovers. Out of them all, I would probably pick the Sunshine to take home. Remember how I said other indie eateries have a part at 33 Acres? Well Bestie is one of them (so is Earnest Ice Cream!) and I definitely had to take advantage of that and order a Bestie Board ($7) which included a pretzel, farmer sausage, pickles and speckled mustard. 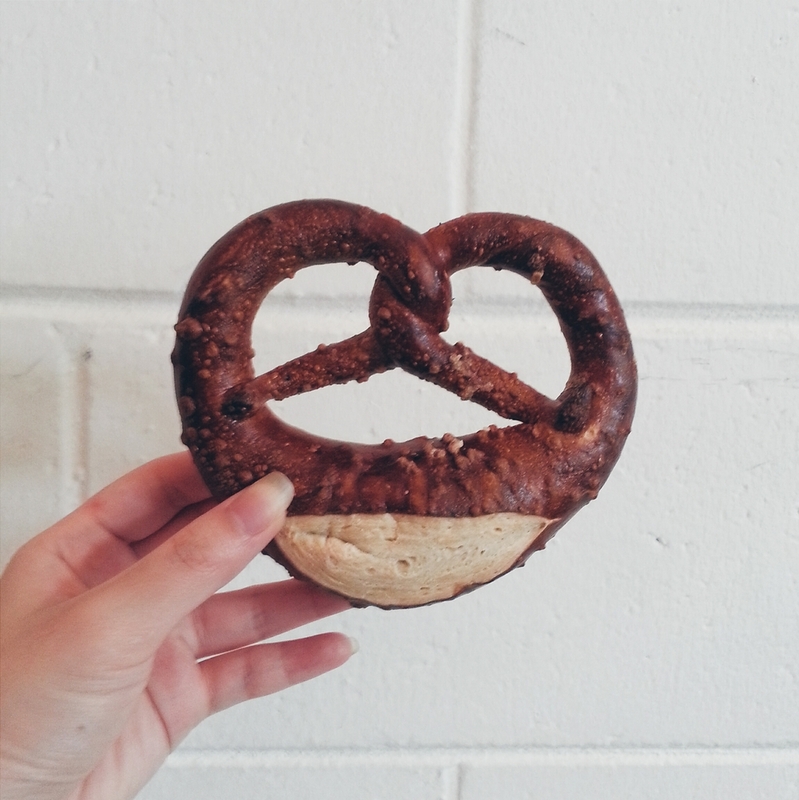 Nothing beats a freshly made pretzel especially when it's paired with a nice slice of sausage and a dab of mustard. I should also mention the impeccable attention and awareness of style and branding associated with 33 Acres. There is a distinct minimalist style with the wooden and stone accents on white brick textures. I'm not even sure how it's possible, but I would describe their style as a modern vintage fusion of natural textures embossed with a Kartika-like font which makes up their aesthetically pleasing space. The staff at 33 Acres call their space "a synthesis of forest and Pacific" - which I think is a right-on-point description. Not only is the space itself lovely, but the people 33 Acres attracts (at least during my visit). Friendly customers with a genuine interest in a great glass of beer and an interest in local food. Friendly staff as well.